I don't often get to hang out with my siblings without the spouses, kids and other distractions. So, when I decided that I would head up to Chicago for a weekend to relax and see some old friends, it felt like a great opportunity to get some of the family together to catch a ballgame. 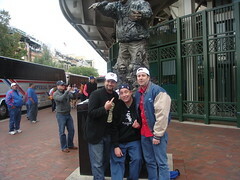 The Cubs just happened to be playing yesterday, so myself, CJ Mac and Mike took in the game with Jason tagging along. It would have been even better if I could have gotten Johnny Mac and our sister to attend, but this thing was so short notice, it was impossible to get everyone together. Next year, though, we're all committed to getting together for a game. This time, the White Sox.